Prep Day: Place onions, oil, vinegar, hot sauce, mustard, paprika, cajun seasoning, and garlic in a blender. Blend 5 or 6 seconds; turn off; stir, blend for another 5 or 6 seconds. Add green onions, and blend for 2 seconds. Do not blend longer or you will have puree. Add 1 1/2 cup mayo if you like it creamy. set aside for 30 minutes or so; you don’t have to wait that long, but the sauce will be better over time. Bag and set aside. Place Cajun seasoning and fish in freezer bag and shake till well coated. Place remoulade bag inside fish bag and freeze. Serve Day: Thaw. Shred lettuce and slice tomatoes. Warm bread in oven for 5 minutes or so. Pour enough peanut oil in a large frying pan to come up about 1/4 inch, and set the pan over medium-high heat until a small amount of water sizzles immediately when you drop some in. Fry fish for about 10 minutes or till crispy. Place on paper towels to drain. To assemble the sandwich, slice the sandwich loaves almost all the way through and smear remoulade on both the top and bottom. 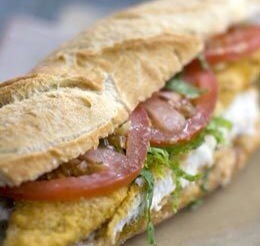 Lay down a layer of shredded lettuce on the bottom of the sandwich, then arrange 1 or 2 fish fillets on top. Lay 3-4 slices of tomato on the fish and press the top of the bread down on the bottom, compressing the sandwich a little. Serve at once with hot sauce and a beer.